An enjoyable read with compelling characters. What I liked: Let me say this upfront...I don't agree with all the politics of the characters but I do agree with the idealism involved. It might work in a perfect world but that's not what has kept me reading this series. I like the world building, the idea of a female president and I certainly enjoy the characters and all the situations Mr. Flynn gets them entangled. The characters come across as everyday people in most instances with real problems. Everything isn't perfect and that's what in most cases makes me buy into the storyline. McGill, "the first man" is somewhat extraordinary in his abilities but he has a firm compass on his role as the President's spouse. He will comply with some rules but not all. After all, he's a retired cop but he's not Superman (it only seems that way in certain situations). I don't know much about European politics but Mr. Flynn fashions it as a believable story. It's over the top at times but immensely entertaining. McGill and his crew kept me more than interested. I also like how The President is portrayed, to a point. Again, it's a bit idealist and over the top in some cases, but I like fiction and suspense. What I didn't like: For me personally, I like and enjoy Mr. Flynn's writing style. So far, in this series, the stories aren't rushed and some might find the going a bit slow, but I found it suited my mood and had no trouble staying connected with the characters and the story. 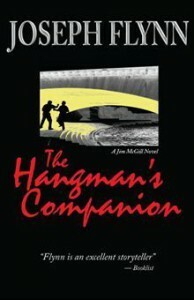 If you're looking for a very well written book, The Hangman's Companion is certainly that. I was caught enough by the characters that I've continued reading the series.